This is the second of the three press photographs sent to us by James and Guy Loveridge for use in our Snapshots. So crisp is the original image that we were able to detect the word Sunbeam on the hub caps. Bruce Dowell, SAHB member and distinguished Sunbeam historian, confirmed our suspicion that this was a 20/60. Bruce also gave us some more information: it is almost certainly from 1925; although there are no surviving company records, Sunbeam made about 1,570 of this 3.2-litre 6-cylinder model – 800 in 1924, 540 in 25 and 220 in 26 – and about 40 survive; the balloon tyres are unusual for Sunbeam; and the ‘suicide doors’ front and rear indicate that the body is not by Sunbeam, but there is no solid indication of the coachbuilder. We know that the car was photographed near Gunnersbury Park Garage, because it can be seen in Snapshot 165, sitting quietly in the background. The 20/60 featured a 3,181cc 7-bearing overhead-valve six-cylinder engine with a detachable head, cast iron block and aluminium crankcase. There was a four-speed gearbox with right-hand change, and suspension was semi-elliptic at the front and cantilever at the back, with four-wheel braking. The rear drum brakes had two separate sets of shoes for the foot brake and hand brake. A Claudel-Hobson carburettor was used with vacuum fuel feed, and ignition was by magneto. The range of production cars produced by Sunbeam in the inter-war years is complex – and it is difficult to detect a theme. However, the 20/60 has been said to be part of a “Phase 2” from 1922 to 1924 that saw the first overhead valve engines and four-wheel braking. For the 1927 programme, Sunbeam replaced the 20/60 by the Twenty, with a smaller engine (2,916cc, still of six cylinders), and with only four main bearings. Production was significantly more than for the 20/60, with 2,560 units built up to 1930, and a further 752 between 1930 and 1933. 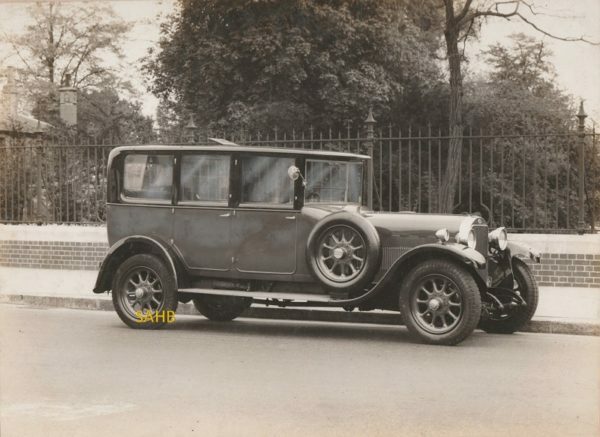 So our image is of a rare car that was said in period to be of a quality to challenge a Rolls-Royce 20, and to be far sportier in character – although any idea of sports motoring seems remote from the elegant limousine we see here.